CEU formally began its new Academic Year today, welcoming students, faculty, staff and distinguished guests with an Opening Ceremony held in the spirit of free inquiry, diversity, and open society that are the hallmarks of CEU. 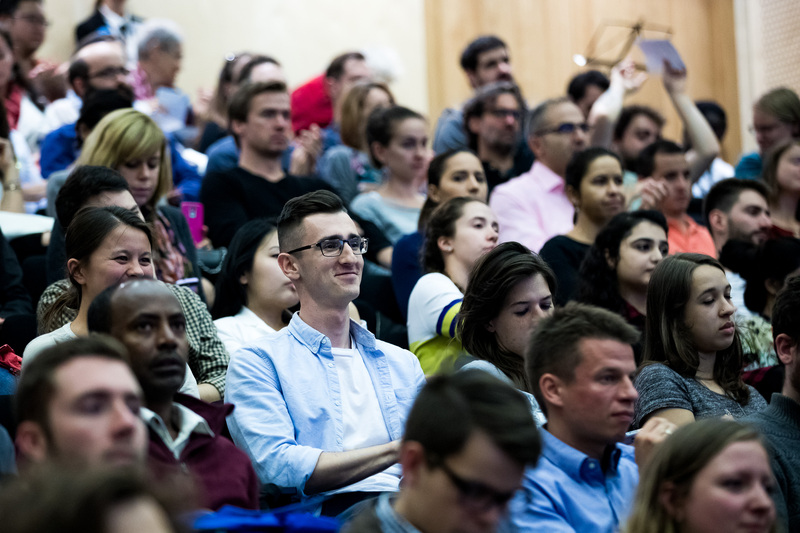 President and Rector Michael Ignatieff welcomed more than 700 new students from more than 90 countries to the CEU community, which now includes 1,500 students and hundreds of staff and faculty, as well as 14,000 alumni worldwide. “For we are a community, brought together as never before by our defense of academic freedom,” he said. “Let me thank the entire CEU community for standing together, during what I like to call, with British understatement, ‘our little local difficulty.’ Negotiations [between New York State and the Government of Hungary] continue, but we remain hopeful that an agreement can be reached and ratified by the Hungarian Parliament.” The full text of Ignatieff's remarks can be found here. CEU community members attending the Opening Ceremony 2017. Photo: CEU/Kepszerkesztoseg, Zoltan Adrian. Ignatieff’s address was followed by remarks from continuing student Viktor Kazai of the Department of Legal Studies, who said "there is one duty that every citizen of this university takes very seriously, namely, the duty to pursue your academic and professional goals with full cognizance of the social responsibilities which come with your privilege of being a person of intellect." Read his full remarks here. Alhakam Shaar, incoming student in the Department of Sociology and Social Anthropology, speaks at the Opening Ceremony 2017. Photo: CEU/Kepzerkesztoseg, Zoltan Adrian. Incoming student AlHakam Shaar of the Department of Sociology and Anthropology (pictured above), spoke of the destruction of his hometown of Aleppo, Syria and his research into the process of rebuilding. Read his remarks here. Associate Professor Dorit Geva of the Department of Sociology and Anthropology addresses the Opening Ceremony on September 18, 2017. Photo: CEU/Kepszerkesztoseg, Zoltan Adrian. 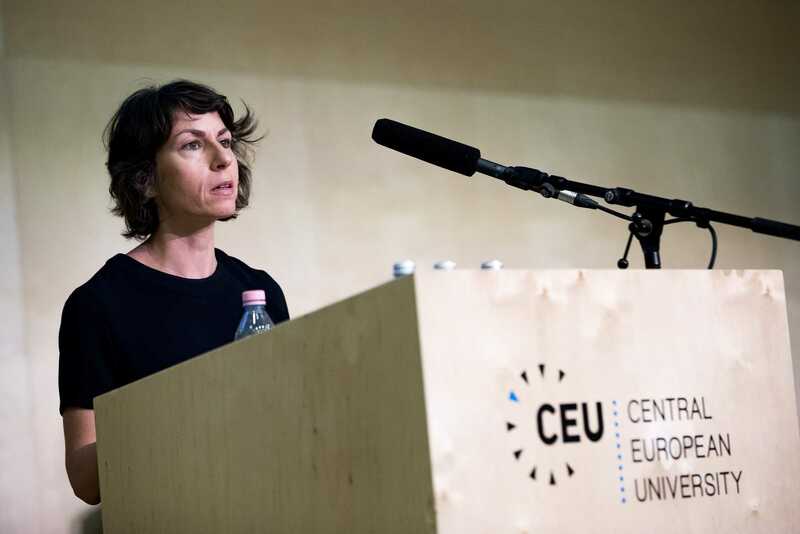 Representing the faculty, Associate Professor Dorit Geva of the Department of Sociology and Anthropology (pictured above), described the things about CEU that will not change. It’s important to remember the founding mission of the university, which is to foster autonomous thought which is, at once, politically and socially engaged, but also detached from state-ideological projects. We will not let that change. Being true to the principle of openness is one of our great virtues. That too will not change,"
she said. Read her full remarks here. Noted Hungarian actress Eszter Onodi read the poem “Incantation,” by Czeslaw Milosz, and soprano Lidia Szluka sang “A csitari hegyek alatt” by Zoltan Kodaly, accompanied by Agnes Arato on piano. Hungarian actress Eszter Onodi reads "Incantation" by Czeslaw Milosz at the CEU Opening Ceremony 2017. Photo: CEU/Zoltan Adrian. Faculty members were recognized for their excellence in research and teaching. Gabor Klaniczay, university professor in the Department of Medieval Studies, won the 2017 CEU Award for Outstanding Research. Tijana Krstic, associate professor in the Departments of Medieval Studies and History, and Gabor Kezdi, professor in the Department of Economics, received the 2017 CEU Distinguished Teaching Award, recognizing their high standards of teaching, linked with the mission and institutional ambitions of CEU. 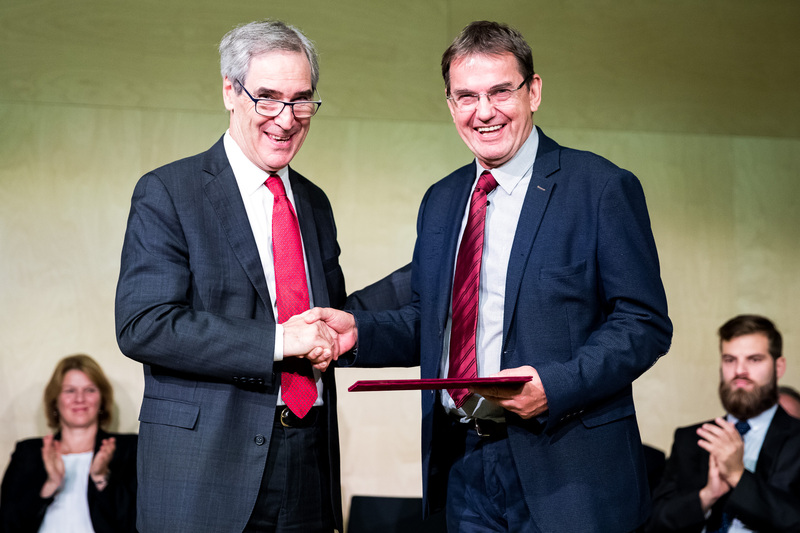 President and Rector Michael Ignatieff and University Professor Gabor Klaniczay. Photo: CEU/Kepszerkesztoseg, Zoltan Adrian. Professor Petra Aczel, Head of the Institute of Behavioural Sciences and Communication Theory at Corvinus University, and Maurizio Pirro, Associate Professor of German Literature of the University of Bari Aldo Moro received the sixth annual CEU European Award for Excellence in Teaching in the Social Sciences and Humanities. 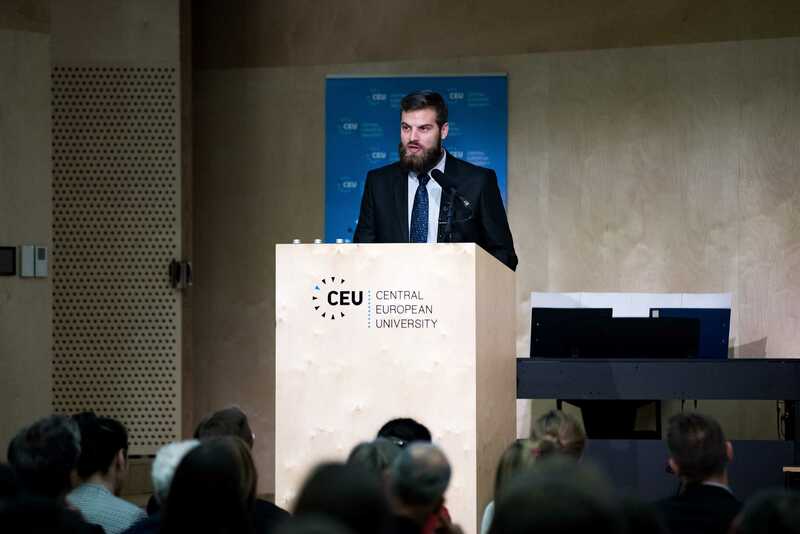 The award, initiated by CEU Provost and Pro-Rector Liviu Matei and overseen by the University’s Center for Teaching and Learning (CTL), aims to promote excellence in teaching across the European Higher Education Area. Aczel and Pirro each also received the accompanying €5,000 Diener Prize. Click here for more information about this year's Award. 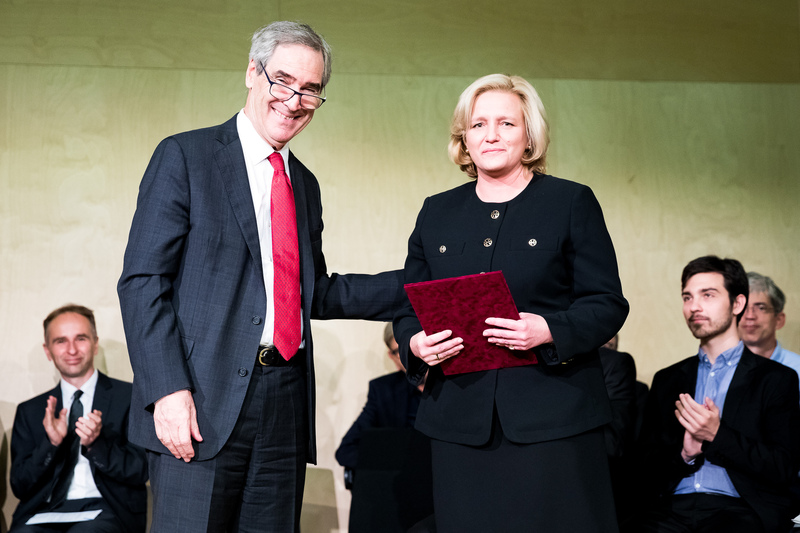 President and Rector Michael Ignatieff and Professor Petra Aczel of Corvinus University. Photo: CEU/Kepszerkesztoseg, Zoltan Adrian.